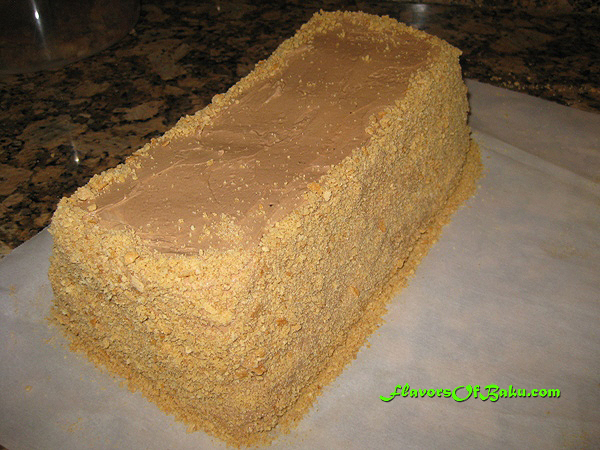 “NAGIL” or “SKAZKA,” which means “fairy tale,” is a very popular and beloved cake in Azerbaijan. Separate the whites from the yolks into two separate bowls. 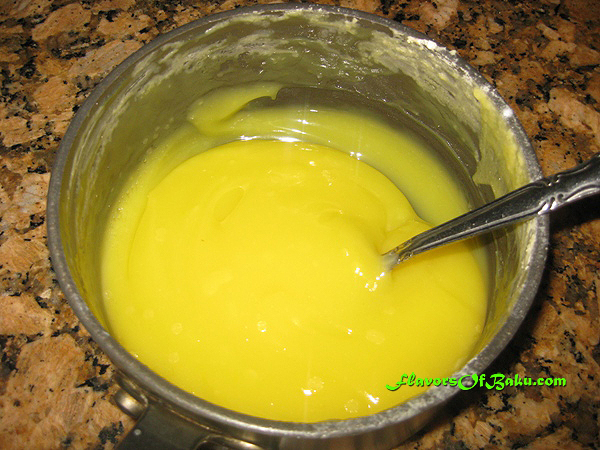 Beat the yolks with an electric mixer with ½ cup of sugar. While beating the egg whites, add ½ cup of sugar in small portions, and continue to beat them until stiff peaks begin to form. 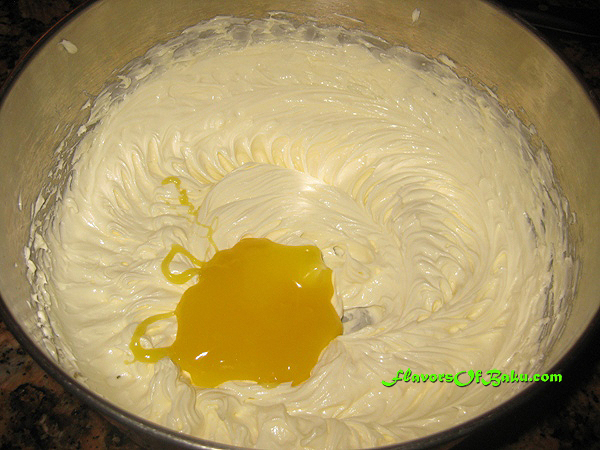 Move the yolk mixture with the whites and mix them together with a spoon. Add sifted flour to the egg mixture and stir gently with a spoon from the bottom up until it is very smooth (do not use an electric mixer). Preheat the oven to 180°F (350°C). 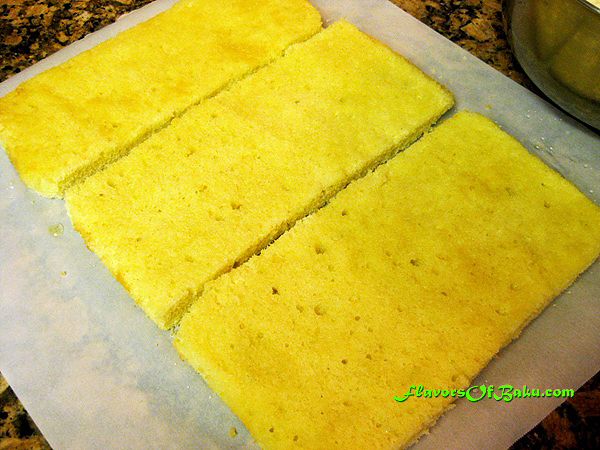 Cover the bottom of a baking pan with parchment paper and grease the inside of the pan with butter. Pour the batter (dough) into the pan, spread it evenly with a spoon or spatula, and bake it for about 20-25 minutes or until the top of the layer is crispy and golden-pink in color. 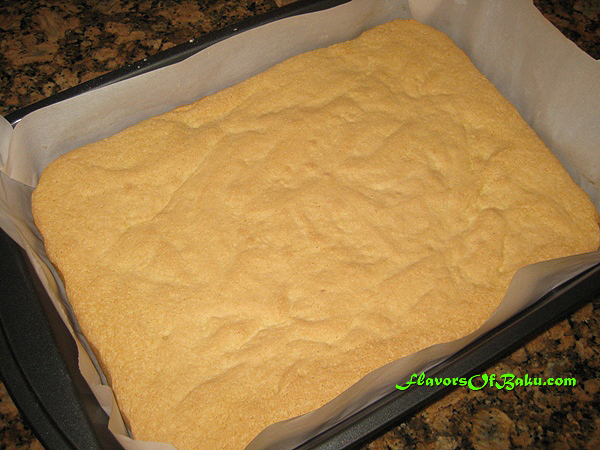 While it’s baking, the oven should not be opened, otherwise the layer will fall. Check the layer’s readiness using a toothpick by sticking it in the center and pulling it out. If it comes out dry, the layer is ready. Turn off the oven, but leave the layer there for a few more minutes before removing it from the oven and leave it to cool in the pan. 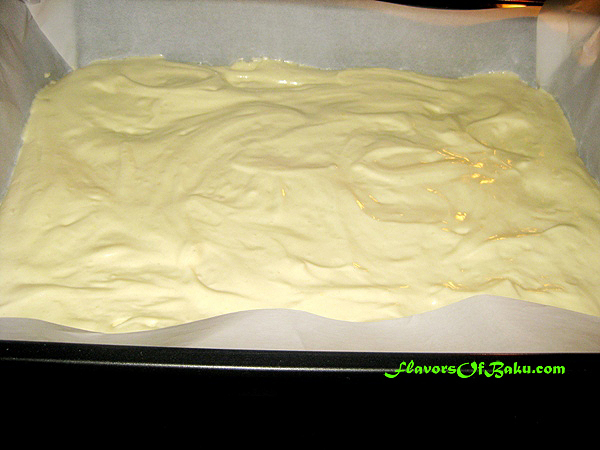 Prepare the layer in advance, a few hours before assembling the cake. 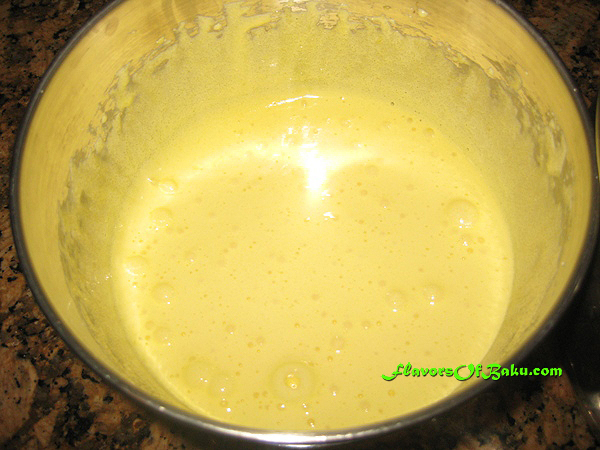 In a small saucepan, whisk together the egg yolks and the milk. Add sugar and slowly steam over a low heat while constantly whisking until the mass is thickens to consistency similar to condensed milk. Remove from heat and let it cool down to room temperature. It will thicken as it cools. 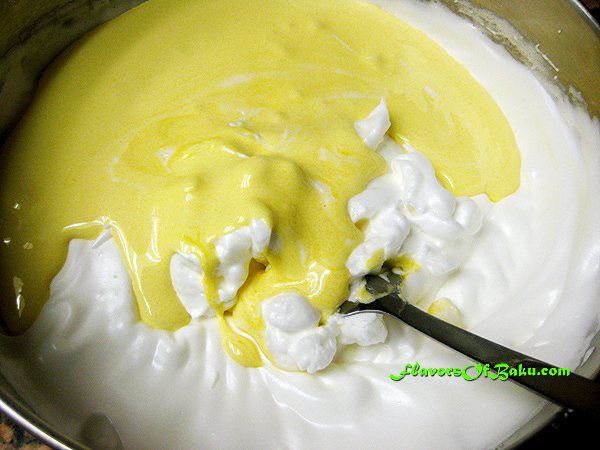 The syrup (as well as the cake layer and cream custard) needs to be prepared in advance so that it has time to cool down to room temperature. In a small saucepan, dissolve sugar in hot water and simmer over low heat for 2-3 minutes, then add the cognac or rum and stir. Feel free to add fruit syrup instead of cognac if you prefer. 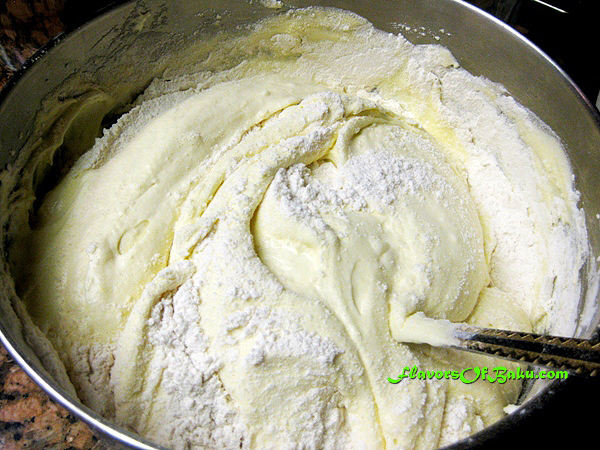 Add vanilla sugar to the softened butter and beat with an electrical mixer for about 5 minutes. 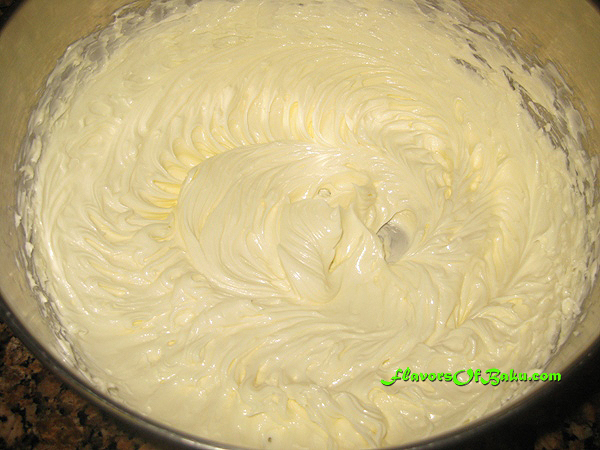 Add the custard cream mixture (1 tbsp at a time) into the whipped butter and beat. Beat until the custard uniform, for about 3 minutes. 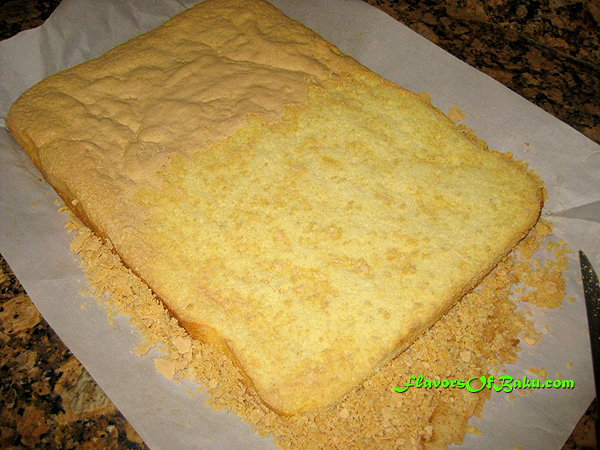 Carefully remove the top crust from the cooled cake layer with a knife, as shown on the picture. 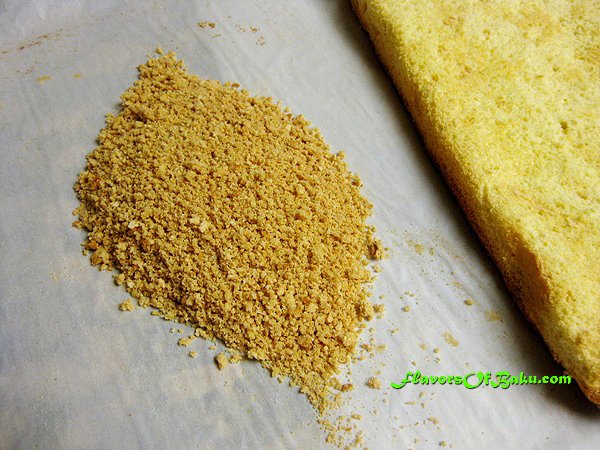 Split the crust into crumbs by rubbing them between your palms. These crumbs will be used to cover sides of the cake. Divide the cake into three unequal parts, so that one is bigger than the last with a difference of 1-2cm. 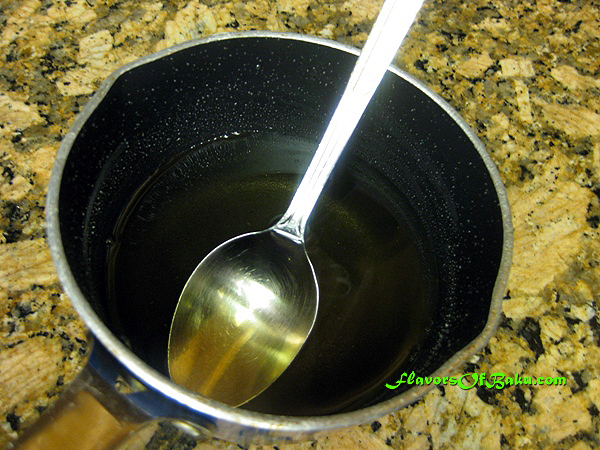 Then brush the top of all three parts evenly with the syrup (about 3 tbsp on each part). Let it soak the syrup up for 5-10 minutes before spreading the cream on top. 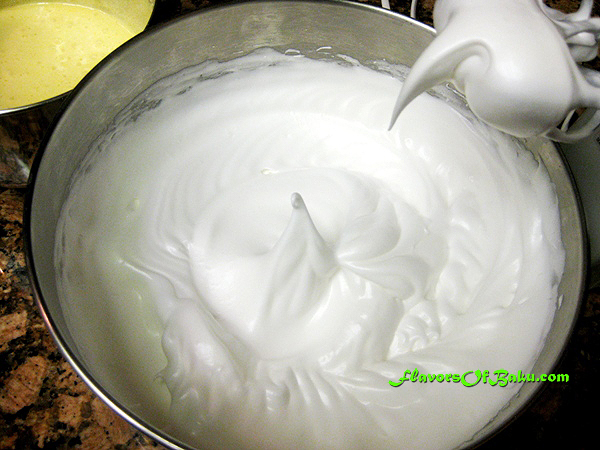 Place about 3-4 tbsp of cream on the biggest layer and evenly spread it across the surface. 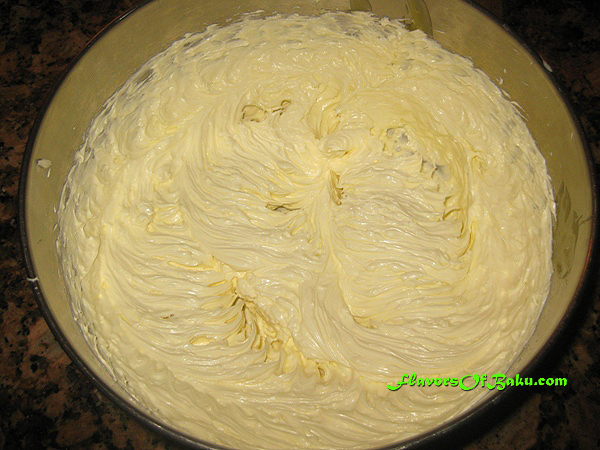 Then, place the middle-sized cake layer on top of the cream, and repeat the process. 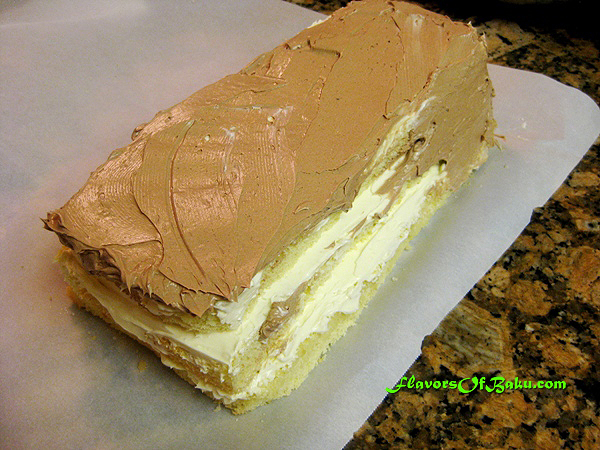 Be sure to save enough cream for each of the layers, the sides, and decorations. 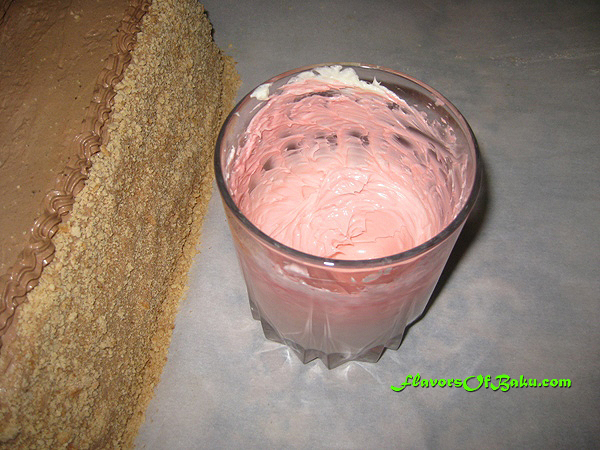 Separate the remaining 1/3 cup of cream to color it pink. Also, separate another 1/3 cup to color it green. 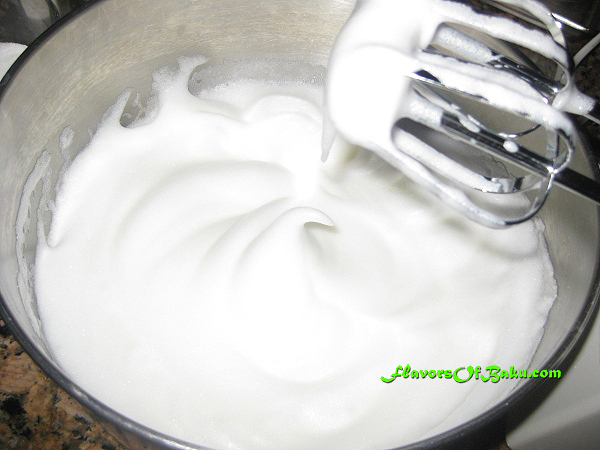 Beat the remaining white cream with cocoa powder using a mixer. 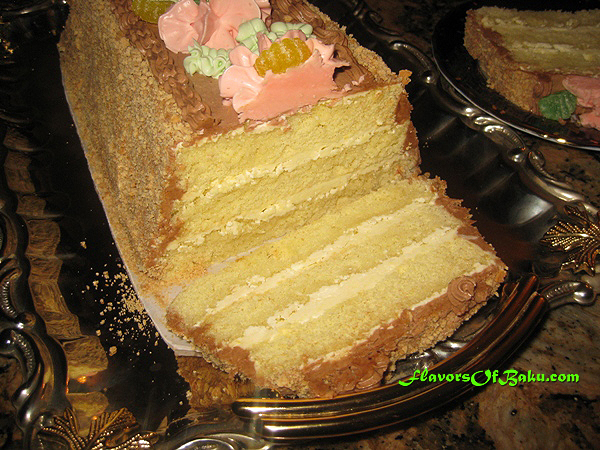 Cover the entire cake with cocoa cream and sprinkle the sides with the crust crumbs. 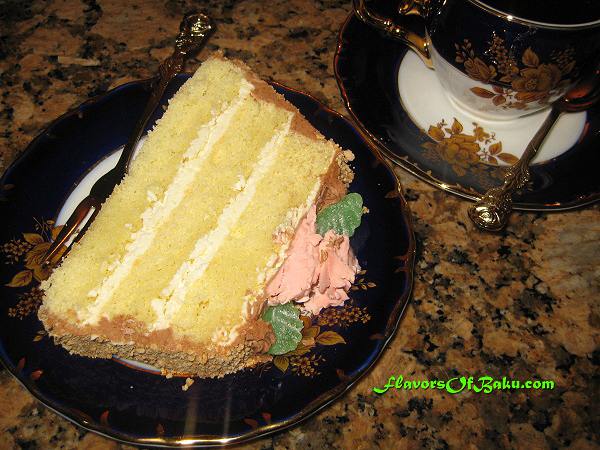 Beat the 1/3 cup of white cream you saved earlier with one drop of red food coloring (no more, otherwise the color will be too dark), and use it to decorate the cake with pink cream roses. Then, beat other 1/3 cup you saved in a glass with a drop of green food coloring. 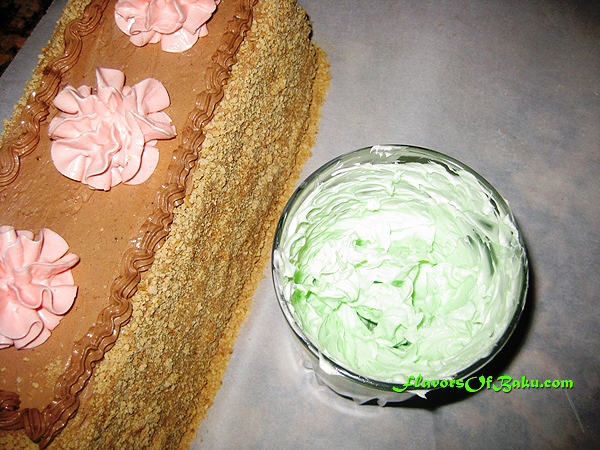 Use it to decorate the cake with green leaves. 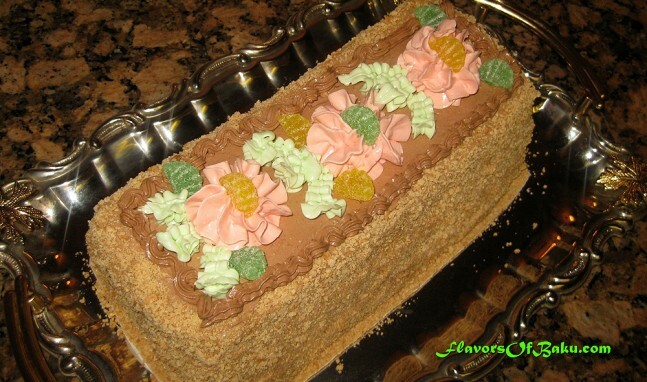 If you do not have icing tips for decorating a cake, just sprinkle cake crumbs around the cake and decorate it with candied fruit and jelly.